During my last written article, we discovered the near joy of finally depending on God completely. Sometimes we are forced to do so through health concerns or disability. Yet, what may seem like disability to people, actually can be turned positive for God. One thing that helps anyone who is struggling in life – whether disabled, ill, or insecure is encouragement. Encouragement is a spiritual service gift mentioned in Romans 12:8. The Apostle Paul tells us “If your gift is to encourage others, be encouraging.” Encouragement means to exhort, comfort, counsel or help. It means to offer thanks or appreciation, and to cheer someone on. Unfortunately the world doesn’t have enough encouragers – most people complain or are critical. But is that actually helpful? Complaining is different than stating a fact and moving on. Complaining and criticism actually tear down, rather than build up. One of my former pastors was named Dale. He used to say that encouragement is the oxygen of life. And so it is. When we encourage with love, words and action we positively impact the people around us. When we encourage in love, we change the atmosphere, and God can bless others through us. And they just may bless us back. Smiles can particularly encourage. I’ve been told many times that my smile blesses people – it disarms shyness and breaks down barriers. I’ve had this happen in church, divine appointments, and on the mission field. It’s the same with calling people by name. Tony and I feel so strongly about encouragement, that we changed the regular wedding vows. Tony did not say he would love, honour and cherish me and I did not say I would love, honour and obey him. Instead, we chose to bless each other with the same promise: to love, honour and encourage. We took that further and promised to always forgive and always strengthen each other. Through 19 years, we have worked to do that. Sometimes it’s been easy, and other times it’s been more difficult. Yet always there is love. Always there is encouragement that comes from the Holy Spirit. Choosing to encourage is a commitment. When you choose to encourage daily – it affects your spouse, your friends, and all those around you. Tony and I are called to underprivileged children. Some of them are latch-key kids. Others are orphans. And yet others have parents, but still need all the love and encouragement they can get. It’s a real blessing to pour this kind of love into people. And really, it doesn’t cost you anything. It’s kindness. It’s just one of the love languages that make people thrive. Encouragement and kindness are linked. Kindness can take many forms. Some of these acts of kindness are practical deeds. Sometimes they are called random acts of kindness. This can be going out into the community and helping a senior clean their home or garden. Or perhaps to provide a sandwich and glass of juice to a child. It could be taking a disabled friend to go do their grocery shopping. In a sense, this is not just something that missionaries do. We can all do this! We have opportunities to be kind every day. EVERY day! Okay, so you’ve had your eyes open to human kindness – which is everywhere. It’s not exclusive to Christians. There isn’t just darkness and evil around, although there is a lot of that. But think of God’s kindness. Think of how he encourages us with love, joy and peace in our hearts. He opens our hearts to more. When we act on and live in this compassion, we grow the fruit of the spirit KINDNESS. The Holy Spirit produces this kind of fruit in our lives: love, joy, peace, patience, kindness, goodness, faithfulness, 23 gentleness, and self-control. There is no law against these things! It is the exact opposite to a lot of the evil in the world. We are also encouraged in Colossians 3:12 to “clothe yourselves with compassion, kindness, humility, gentleness and patience.” These aren’t something we can grow on our own. We need to keep spending time asking to be filled with these things – even patience. However, kindness and encouragement are a lot more fun to grow in than patience! So what are some other ways to grow this gift? It happens with practice! Also when we continue to encourage, we can also receive some back. Remember, what you sow, you also reap. The Apostle Paul writes about this in Galatians 6:7. If you sow kindness, you reap kindness. Patricia King once told a story that she was led to give away many of her clothes. She did this time and again. Each time she did this, she was given more clothes! That’s just a side benefit. But basically, if you are sowing blessings, you will reap blessings. If you sow curses, even if they seem to be deserved curses, guess what comes back your way? Better to stop the cursing right now. There’s way too much of that around. Remember what Paul says to us in Romans 12: Bless those who persecute you. Don’t curse them; pray that God will bless them. So here’s some ideas to grow that gift of encouragement in your life. Write someone a letter. Visit a sick person in the hospital or hospice. Pat someone on the shoulder or back. Sit with someone who has just lost a family member. Listen to someone who is struggling. Ask God what to say, or even, if you’re not meant to speak. Sometimes encouragement is not saying anything at all, but is just to be there with someone – especially if they are grieving. Here’s a good example of encouragement. A young girl known as Little Annie was locked up in a mental institution outside Boston in the US. Doctors saw her as hopelessly insane. Yet an old nurse felt compassion and kindness for Annie, and in time, she responded to the nurse’s attention and regular gifts of brownies. Eventually, Annie was completely changed and wanted to give back to the other patients. Annie became Anne Sullivan, the woman who loved and encouraged Helen Keller. Through Anne’s encouragement through the years, Helen blossomed, despite being blind and deaf in the years before the cochlea implants. 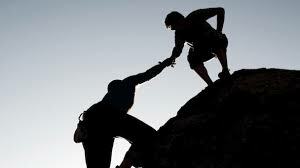 Encouragement is indeed the oxygen of life, as the words used also nourish our souls deep within. Choose to bless someone with encouraging words, or actions today. Once you make this a habit, it will become a wonderful lifestyle. We were created to love. We were created to grow in love. So choose to be kind and encourage, even when you don’t feel like it. Here’s a small example of my own. When I still lived in Ottawa, I had two radio shows on CKCU. One is a Christian show called Over My Head, where we would play music from artists from a Christian world-view. This could be music of any genre – from contemporary classical, to jazz, to blues, to folk. The other show was Window of Opportunity, a folk show where we would especially encourage up and coming folk musicians. Some were local, others from further afield. Two musicians played in our studio live – Shane and Lynne. Shane is a bluesy folk artist, who was accompanied by his then-girlfriend Lynne. Lynne was and is a great musician in her own right. She has a warm clear voice, and light touch on the acoustic guitar. I was given insight during my interview with them, and encouraged Lynne on the spot. I asked her, “What about your own music, Lynne? I think you have wonderful potential.” Lynne had a pained expression on her face, and unfortunately I can’t remember what she said. However, apparently she needed to hear my encouragement. She in time released her first cd, “Things I miss.” This was the first of many cds to come. She wrote a lovely note in the thanks section of that cd liner. She gave thanks to “Laurie-Ann for saying the right thing just when I most needed to hear it.” While I made a point of encouraging all of the artists who I had on the show, it was even more special when what I said made a turnaround for Lynne. And what a turnaround it was! Not only is Lynne an amazing singer-songwriter, but she also pairs with Lynn Miles as part of the Two Lynn(e)s! So never underestimate the power of encouragement. And when you are the one to encourage, it blesses you back. Now think of all the people who need encouragement out there. Too often some people work or minister for years and never know whether know how well they are doing. They get no positive feedback, and eventually if they make a mistake, they only receive criticism! Please encourage the people around you. Like Lynne, this may be the moment they need it the most. Lord Jesus, I lift up my friends who are reading this and ask that you enlarged their hearts. Also enlarge mine. Give us the promptings to be kind and encourage at just the right time. Thank you for how I could encourage Lynne. Please give my all who are reading, the special opportunity to bless and encourage. Let it become something that will catch on as they pay it forward. In Jesus’ name. Click the link here: Ways to Grow in God podcasts This particular podcast is #12 It comes up as after the podcast on Growing in God through Bible Study. The audio versions are in a completely different order than the articles on this website. The audio versions are sometimes updated stories, but other times are completely new. However you receive these teachings, I pray they will bless you. This entry was posted in South Africa, Talks in Africa, Ways to Grow articles and tagged Anne Sullivan, Coppleswesterncape, encouragement, God's kindness, wedding vows, Window of Opportunity folk show, WTGIG podcasts. Bookmark the permalink. A lovely article! Thank you and God bless. Thanks Varuni! It’s a topic dear to my heart.